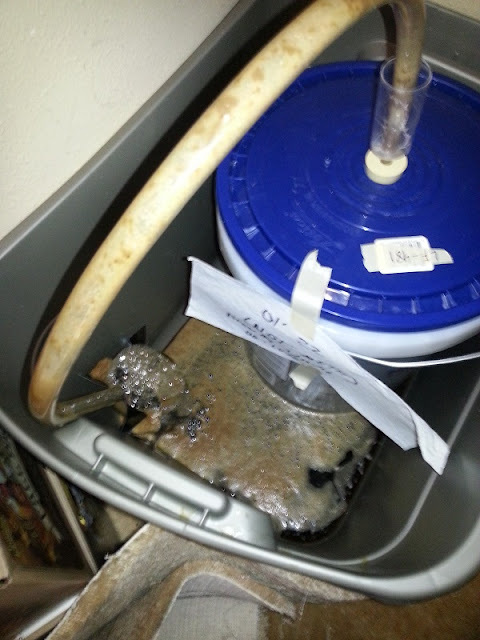 As I had predicted during brew day, I came to find my fermenter in an extremely lively state 2 days later. 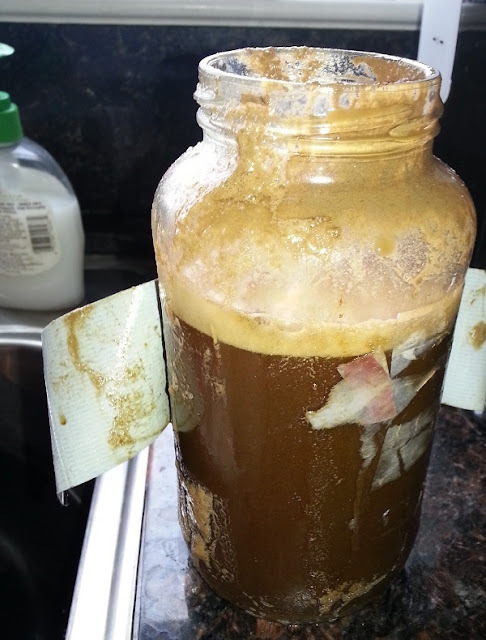 Yeast and beer had erupted through the blowoff tubing and filled up the jar of airlock fluid. 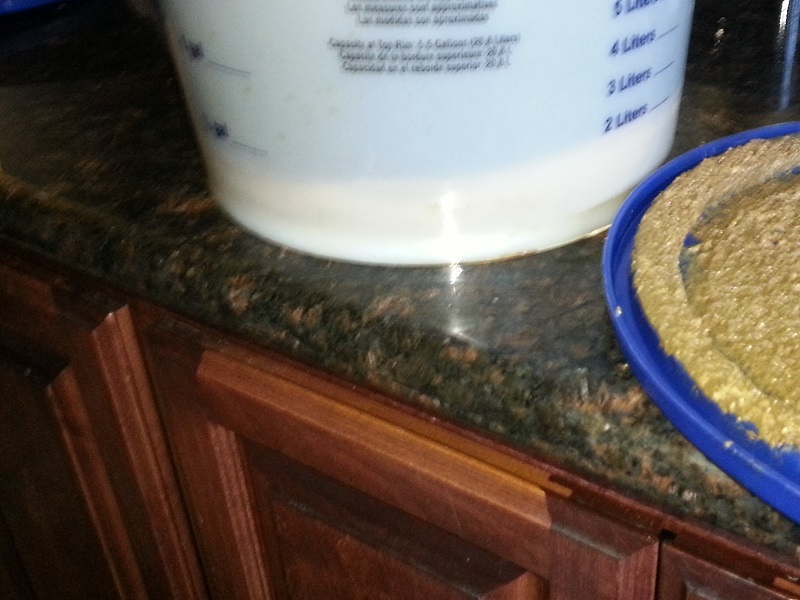 The remaining beer spilled into the containment I had placed the fermenter in. Man did it smell good when I opened the door. To remedy the situation, I removed and replaced the jar filled with yeast and beer with a new, larger container. That way any potential infection from the blowoff jar would not be able to find it's way back into the brew. 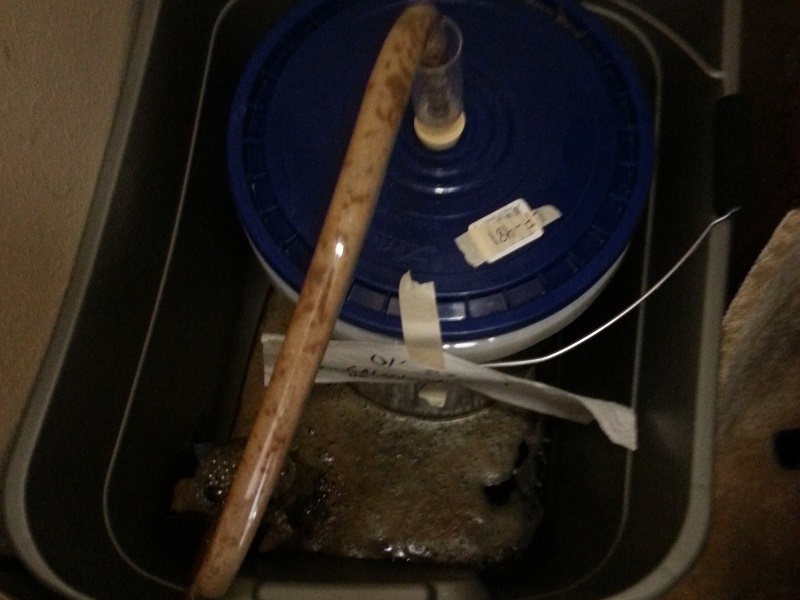 But that possibility is very unlikely as the Burton Ale Yeast is spitting off so much CO2 and yeast. Luckily, no more yeast was blown off after this incident. Cleaning up all the beer in the containment was not a fun task though. Look at all that yeast! If I'm to keep making brews with Burton Ale Yeast like this one, I should look into making a pseudo-Burton Union system to capture and recycle any blown off yeast. 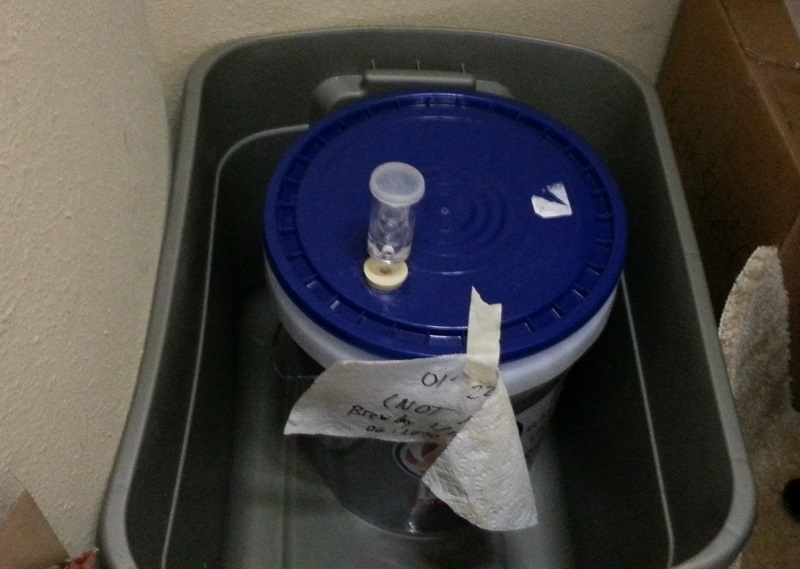 It would minimize the chance of infection, prevent the loss of beer, and allow for easy yeast harvesting. 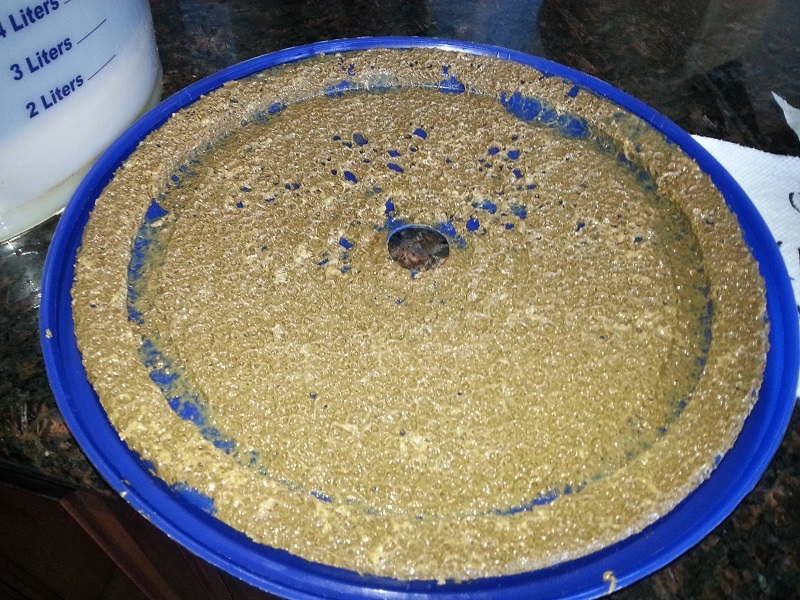 Anyone thirsty for some recovered beer? 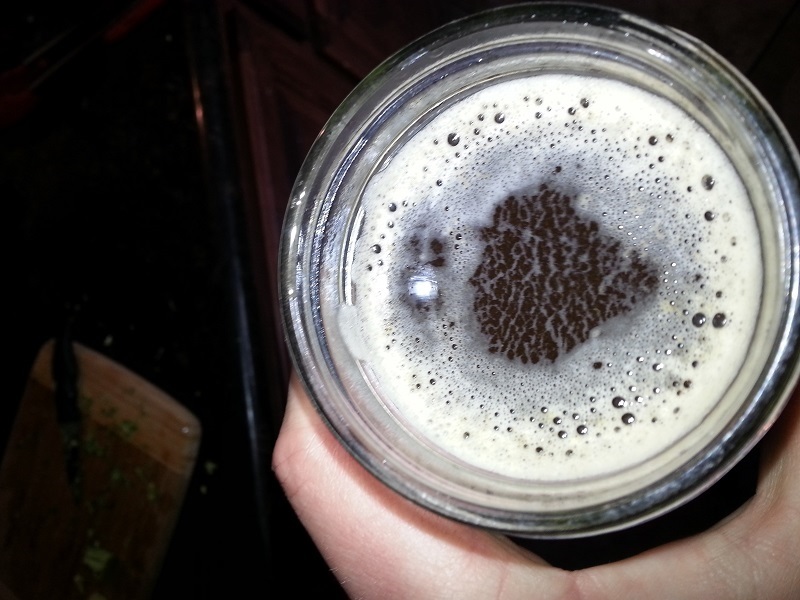 I filled up about 2 mason jars full of beer that spilled into the containment. I kept some around to test the gravity on the brew later. It was at 1.010. I did not expect this brew to get that low. That means this ale is at 8% ABV. When it came time to siphon this monster to secondary, I could only guess what I would find on the underside of the lid. It wasn't pretty. I've never seen a lid coated with yeast quite like this one. The beer definitely smelled and tasted good. I describe it as tasting like "unburnt caramel darkness". 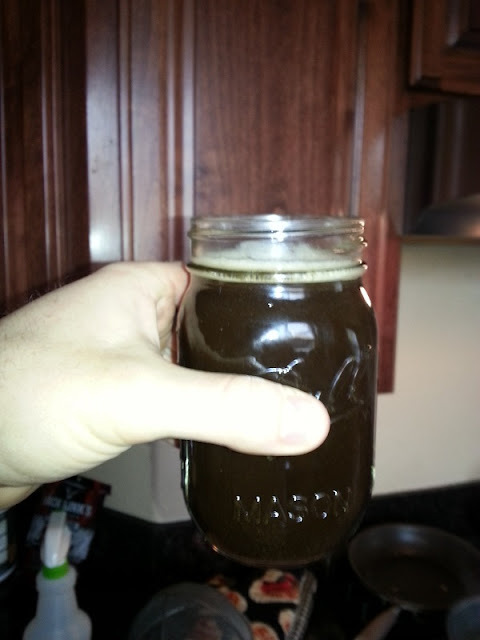 The Midnight Wheat really added no roasted character at all. Very peculiar! Maybe lost ~4 bottles of beer from the blowoff. 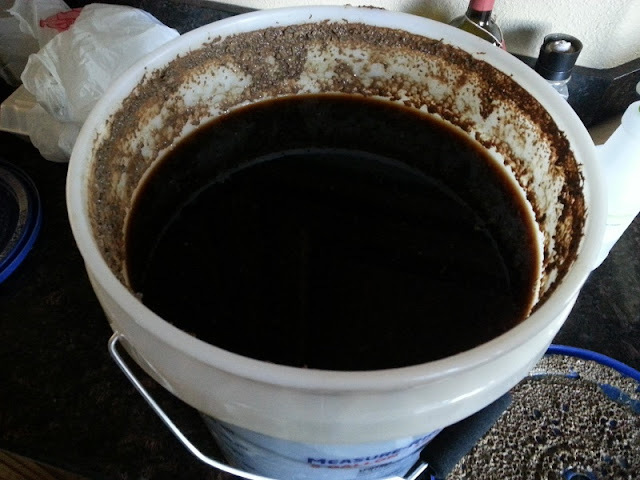 I'll get this brew bottled after a week of secondary or once I have enough beer bottles, which ever condition is satisfied first. I can't wait to taste this thing once it's carbonated! Putting on a nice, clean, sanitized lid for secondary.